Germany's onshore wind sector hit "negative growth" for the first time in July with a record low of just 22MW added, compared with 35MW of decommissioned, reported onshore wind agency FA Wind (Fachagentur Windenergie an Land), with only 4GW left in the permitted pipeline. Just 2,073MW was newly online in the first nine months of 2018, less than half of the 4,167MW commissioned in the same months of 2017. With 162.5MW of closures after an average operating time of almost 18 years, net growth in Germany for the period was 1,908MW. For the whole year, the organisation predicts gross additions of 2.4-2.9GW, just 46-55% of the gross 5,334MW capacity commissioned in 2017. 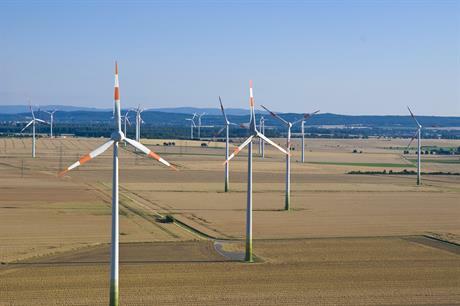 At the 2018 growth rate, Germany's annual onshore wind additions will hardly keep pace with potential decommissioning as old turbines drop out of their 20 year support mechanism in volumes amounting to 2.6GW in 2021, 3GW in 2022 and 2.7GW in 2023. To meet Germany's target of 65% renewable energies in electricity consumption to 2030, onshore wind needs to grow at 4.5-5GW a year, according to Bundesverband Windenergie (BWE), the German wind energy federation. Permits have also become scarcer. Only 1,120MW of capacity was newly permitted over the January to September 2018 period, 60% less than the average for the same nine-month period in 2014-2016 years. By the end of October 2018, just 4GW of capacity was in the permitted pipeline. In the sharply shrinking market, Enercon installed 1,184MW, strengthening its market share to 57% in the first three quarters of 2018. In the same months of 2017, its market share was 39% of the total 4,160MW, or 1,617MW. Vestas' market share was 22%, after 21% in January to September 2017, while Nordex dropped to 10% from 15% and Senvion from 9% to 5%.